Mountain Reedbuck or Redunca Fulvorufula is a very elegant animal. This antelope inhabits mountainous areas – up to 5 km high (3 miles) near African savannas where the plant life is poor. Differently from other African antelopes the Mountain Redbuck stays in the same place for the whole year and does not get involved in migration. Mountain Redbucks are usually 60 – 80 cm tall and 110 – 130 cm long. The tail is 20 centimeters long. They weigh 20 – 30 kilograms, females being slightly heavier than males. The fur is thick and light rusty. A characteristic shared by all the Mountain Reedbucks is that they have a naked fur-less spot behind their ears. 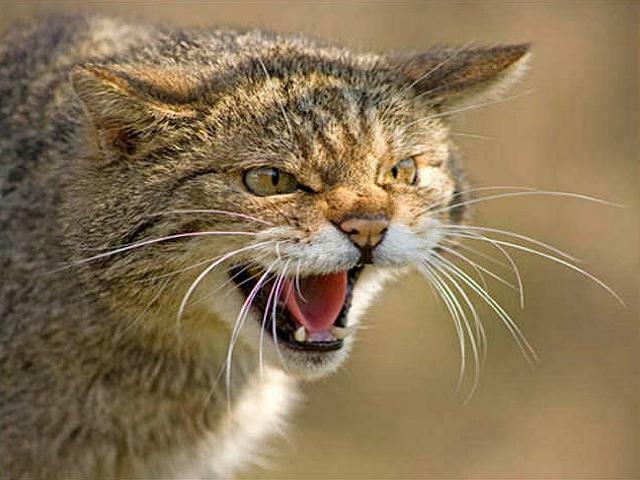 A single male’s territory is usually 25 square kilometers. The buck does not mark its territory with urine or feces but regularly runs around it making noises that resemble high pitched beeps. If the Mountain Redbucks do not live alone they form herds. While the herd is grazing at least one of the Mountain Redbucks stays on guard and looks out for trouble. If a jackal or a leopard is spotted the guard whistles loudly and the herd runs away. In territories that are inhabited by Redunca Fulvorula the only plant life usually is hard and dry grass. However the poor choice has an advantage – there is not much competition for food. In regions close to humans the only competition might be goat and sheep herds. Mountain Redbucks usually graze in the mornings and evenings. They eat grass, leaves and branches as the nutritional value of the diet is low those mammals have to eat a lot. Because of the scarcity of water the Redbucks have learned to go long periods of time without drinking water and acquire it from the plants eaten. According to current observations the Mountain Redbucks do not have a specific mating period. Most of the offspring are born when there is enough food to go around. 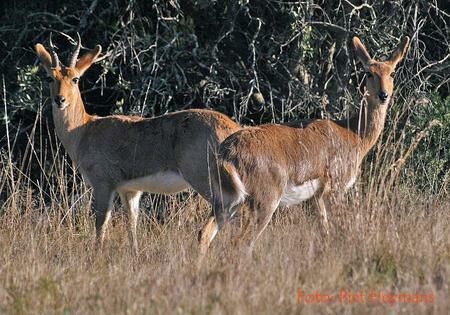 The Redbucks in southern Africa usually give labor in the period from November to March however the Redbucks living more to north may mate in different time of year. The dominant or alpha male usually mates with several females from his territory, sometimes with females that are just passing through his territory and are not from his herd. Birth is given to one baby buck after eight months. The baby buck’s movements are very awkward at first, but it tries to find safe shelter just after birth, this is vital as mothers often leave their young alone. This species is not endangered and the population is not decreasing. The biggest danger posed to Mountain Reedbucks is the occasional lack of food in the dry seasons, as well as being a popular hunting target for humans.